Always desperate for intelligent comedies to balance our preoccupation with overwrought family dramas, this one succeeds by accepting its limitations. There?s an honesty and whip smart humour to the micro-budget Everyday Is Like Sunday that separates it from similar fare, and Moondi and Sloane have expertly distilled the disillusioned charm shrouding Toronto youth into snappy dialogue. If only every film about this doomed generation could be so smart. 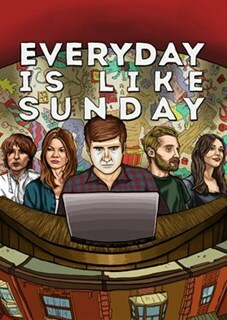 Everyday Is Like Sunday is a comedy/drama aiming the lens at post-collegiate characters stuck between their imminently-ending youth and impending adulthood. The film follows Mark, Jason, and Flora, as they realistically attempt to pull themselves out of economic and emotional doldrums.